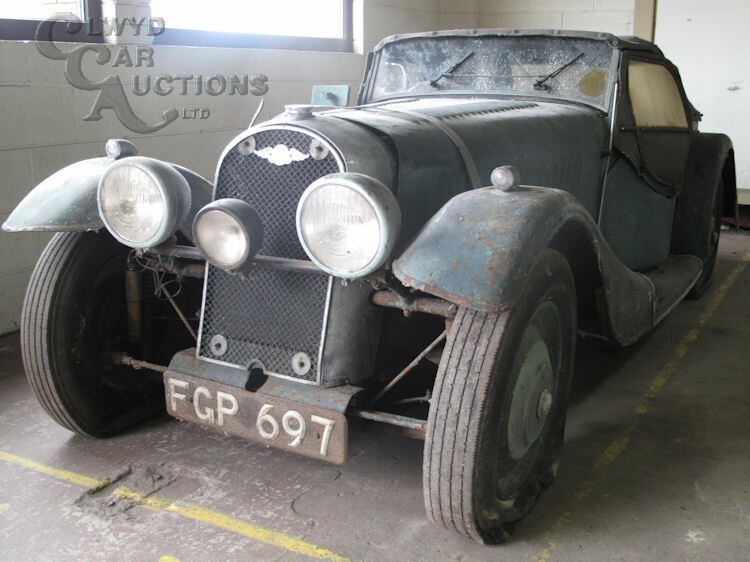 This 1938 Morgan 4/4 appears to be a genuine barn find from a deceased estate. The car will be auctioned by Clwyd Car Auctions on Monday 25th April 2016. 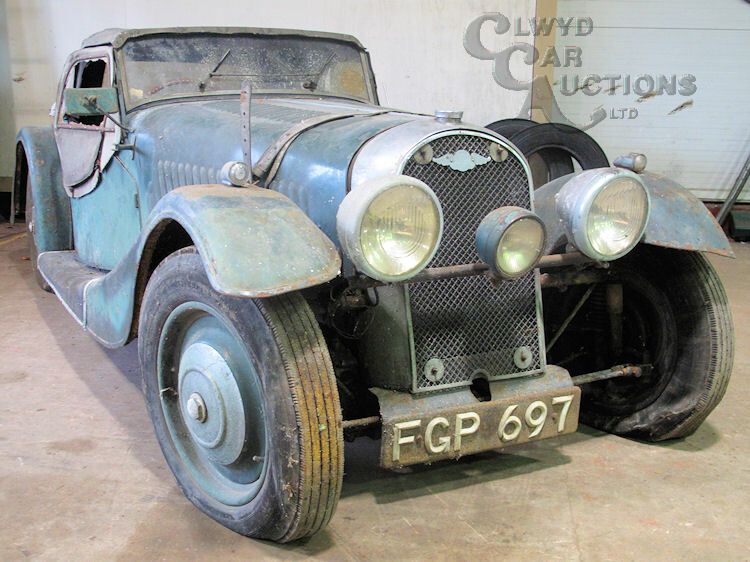 To see the Clwyd Car Auctions sale page for this car click here. To see the eBay page for this car click here. This car also appears on Barnfinds.com which you’ll find if you click here. 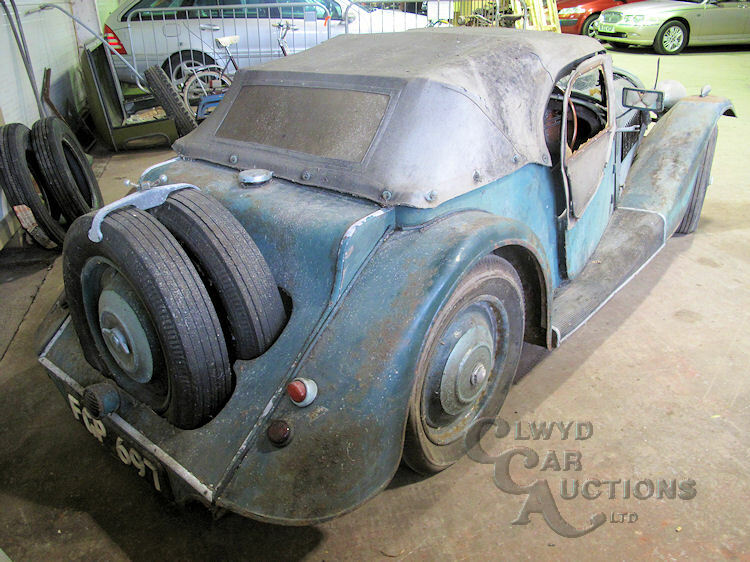 The car looks to have reasonable body panels and Clwyd Car Auctions say the engine can be turned over by the crank handle, however, this is a wooden framed car and the condition of the wooden frame is unknown. 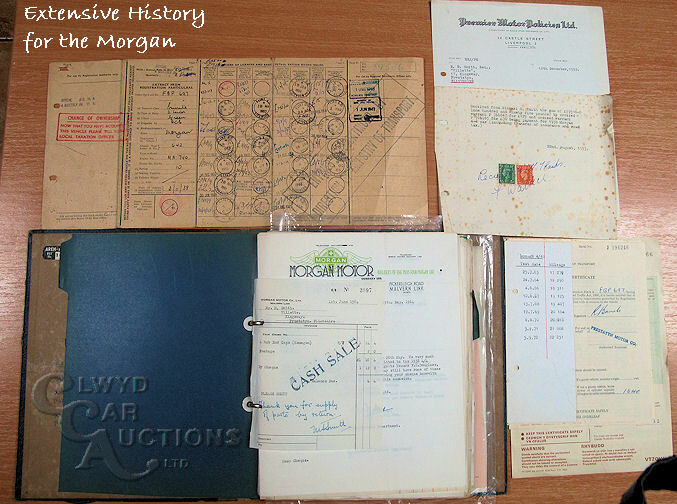 Below is the walk around video from Clwyd Car Auctions via YouTube. Fully restored this Morgan is not likely to fetch vast sums of money but, depending on the cost of the car and the cost of restoration could provide a reasonable profit margin for the restorer. 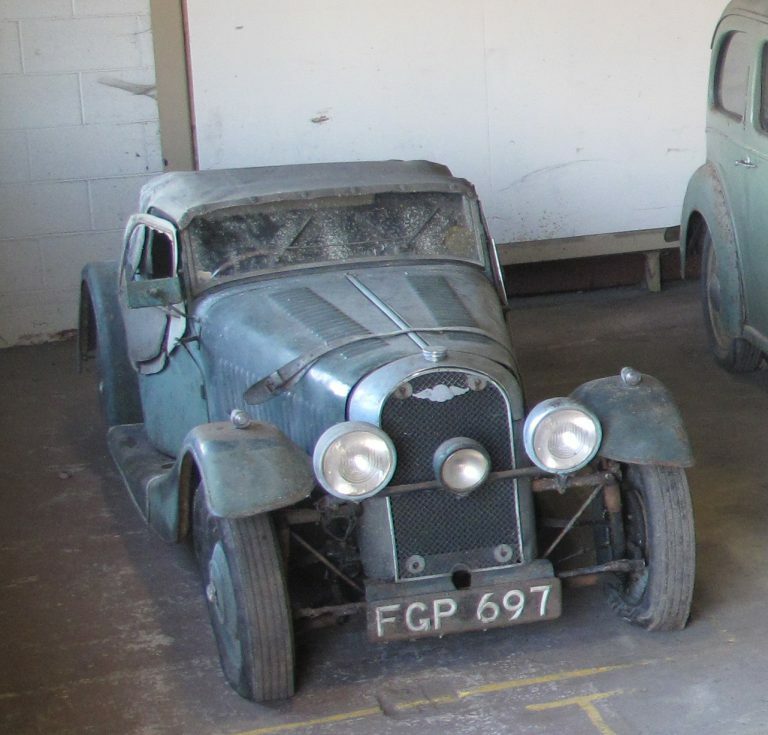 Otherwise it could be a good but demanding project for a hobby restorer looking to keep the car and enjoy it. 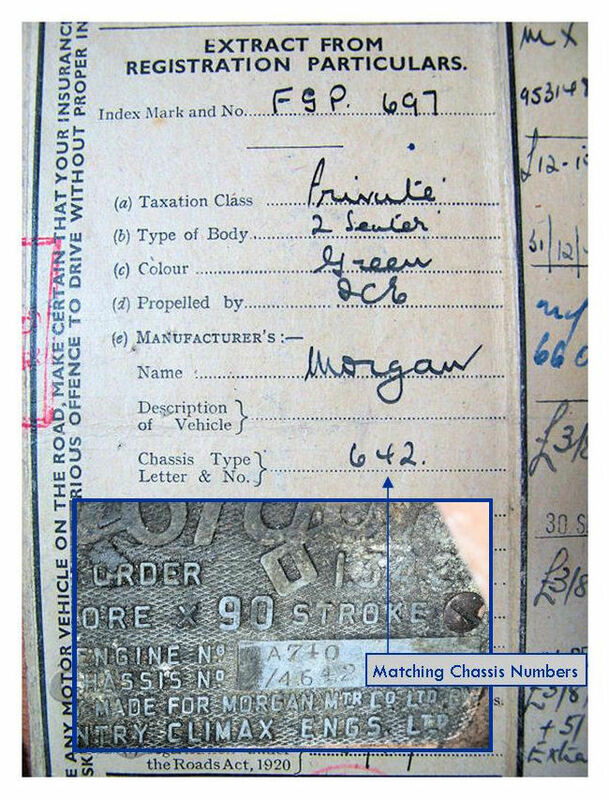 The car comes with a decent set of documentation and it looks as if the chassis number in the documentation matches this car. It is strongly recommended that a potential bidder have a really good look at this car before deciding on how much they might bid, i.e. take your overalls and be prepared to have a bit of a crawl around underneath. Pay particular attention to the condition of the wood in the frame. As many readers will already know the Morgan 4/4 was Morgan’s first venture into making cars with four wheels. The 4/4 meaning the car has a four cylinder engine and four wheels to hold it up. These early Morgans just ooze character and I for one would like to see the modern Morgans available with this body style rather than the rakish modernized one they’ve had in recent decades. The Morgan 4/4 first went into production in 1936 as a two seater, with a four seat version being introduced in 1937 and my personal favorite the Drophead Coupé appearing in 1938. The engine of these cars was a Coventry Climax 1,122 cc in-line four inlet-over-exhaust engine producing a modest 34hp. In 1938 a special version of the car raced at Le Mans and qualified for the Biennial Cup. Top speed of these cars was around 80 mph and they could accelerate from standing to sixty miles per hour in the not at all neck snapping time of 28.4 seconds. Mind you accelerating one of these Morgan 4/4’s to sixty miles per hour is a fun driving experience, in fact these cars provide an enormously enjoyable driving experience, which is why Morgan is still making the 4/4 in its twenty first century version and which is also why people are still buying them. To get an idea how this auction car might finish up looking once restored you can have a look at one on Car and Classic.co.uk if you click here and there’s another one in a different colour on car-from-uk.com if you click here. (Feature image at the head of this post courtesy deeside.com, all other images and walk around video courtesy Clwyd Car Auctions. Video “Building the Morgan 4/4 – 80 years in 4 minutes” courtesy Morgan Motor Company. ).